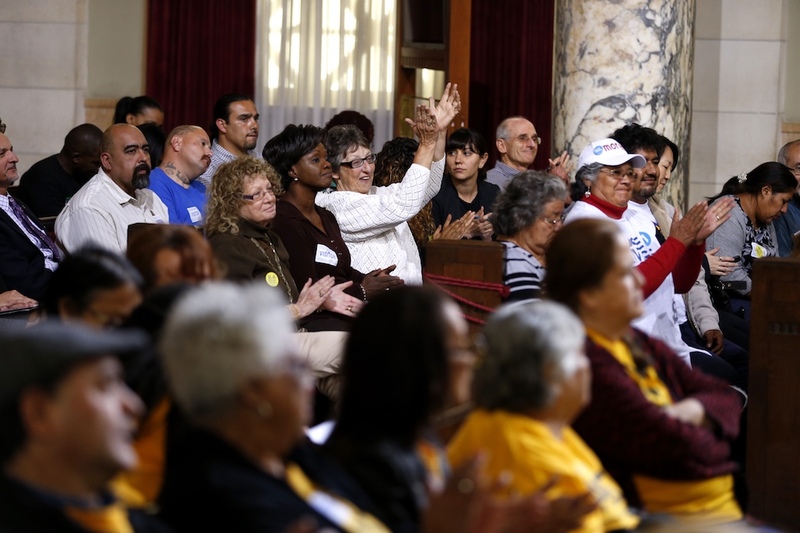 Supporters of the minimum wage increases applaud a speaker at the Los Angeles City Council's Economic Development Committee special hearing, May 2015. America not only needs more jobs but also—and especially—higher wages. The U.S. economy’s failure to provide good jobs with higher wages that help reduce inequality has already significantly damaged the country. The 2007–2009 financial crisis and Great Recession were both fueled in part by stagnant wages and extreme economic and political inequality that gave more power to the wealthy, drove Americans into great debt, and exacerbated Wall Street speculation.4 The stability of American democracy may be threatened if these trends persist and if the economy continues to fail so many people. Raising wages for most Americans requires several different policy reforms, including those that create tight labor markets, raise the minimum wage, promote in-demand skills, and strengthen government supports. However, the most effective and direct way to boost wages is to modernize how workers negotiate for a raise. Indeed, it is hard to imagine how the vast majority of workers can secure consistent pay increases without having the power to bargain for them. Collective bargaining—where workers negotiate as a group with their employer—has proven to raise wages and reduce economic inequality.5 Unfortunately, our current system of collective bargaining no longer works very well because the law hasn’t kept up with changes in the economy. Current law is dramatically tilted against workers trying to organize and bargain collectively, with virtually no repercussions for companies that break the rules.6 This allows business owners to clamp down on their workplaces and stamp out unionization efforts through legal means—such as by forcing workers to attend mandatory anti-union meetings with their supervisor—and illegal means—such as by punishing or firing workers for supporting a union.7 The weakness of penalties has become a bigger problem over recent decades as employers have increased their opposition to unions. A central but lesser-known flaw in the current U.S. bargaining system is that it channels negotiations to the firm level—or a unit within a firm—instead of to a higher level such as a group of firms in an industry. As the percentage of workers in unions declines—currently it is just more than 6 percent in the private sector—firm-level bargaining leaves out a growing share of the workforce.8 Firm-level bargaining also exacerbates conflicts between workers and employers because it generally causes unionized firms to have higher labor costs than their competitors, further incentivizing anti-union efforts. Firm-level bargaining has become even less effective in recent years as companies have contracted out work and directly employed fewer people.9 As firms’ structures change, workers often have trouble negotiating with the firm that is actually in charge and increasingly risk receiving lower pay and losing benefits when their employer changes. The United States needs a different kind of collective bargaining that responds to the changes in the economy over recent decades. In this modernized bargaining system, virtually all workers would be able to collectively bargain; bargaining would occur primarily at the industry level; and workers would have sufficient power to negotiate with employers. This new kind of bargaining can be created through a national policy of bargaining through wage boards, where employers, workers, and the public negotiate collectively. Wage boards would represent a significant change from the current bargaining process, but they have a proven track record in several U.S. states as well as in other countries. Wage boards would also help boost productivity by ensuring that similar work receives similar pay. This enables a more efficient allocation of resources and encourages more cooperative firm-level relations between workers and their managers.11 Wage boards would help high-road businesses compete on an even playing field, as low-road employers would face new minimum standards for pay and benefits. In order for bargaining above the firm level to function properly, workers must be able to take collective action without fearing retaliation from their employer. Not only does current law fail to protect actions necessary for firm-level bargaining, but it also provides fewer protections for the kinds of actions—such as boycotting and striking—needed to make industry-level bargaining work. This is why policymakers must broaden and enhance worker protections. Additionally, wage boards create a free-rider problem because workers will benefit from higher standards even if they do not pay the costs of achieving them. As a result, wage board policy reforms will need to establish new ways of joining unions and other worker organizations that do the work necessary for industry-level bargaining. Although a key move in a new industry-level bargaining system should be to establish wage boards, it is also important to note that this kind of bargaining would work best in conjunction with—and indeed may depend upon—several complementary labor policies such as works councils, workers on corporate boards, and incentives for membership in unions, as described in the following section.13 These policy reforms would complement and benefit workers more than an increase in the overall minimum wage because they would reach a broader range of workers as opposed to just those earning near the minimum wage, and ensure that workers have greater say in their working conditions. The basic principle ingrained in federal law is that workers have the right to join together and bargain collectively to improve their conditions. Current law, however, does not guarantee these rights in practice. U.S. labor law needs to be updated to ensure that workers can exercise their collective voice and do so in the most effective manner. Brings together employers, workers, and the public to negotiate wages and benefits for an entire industry. Can raise wages for all workers, improving compensation for middle- and low-income workers, regardless of their race, gender, sexual orientation, or classification as independent contractors. Can make American industry more productive by helping similar work receive similar pay as well as by facilitating collaborative workplace relationships and promoting additional training. Has proven successful in several states, such as New York and California, as well as a number of other countries including Australia. In the modernized system, the new roles that unions will perform, such as helping negotiate minimum wage and benefits standards across an industry, will be different from the roles many people associate with today’s unions. The new system will also foster different kinds of worker organizations, such as works councils. The proposed reforms can be thought of as both modernizing unions and creating new types of organizations. While they will perform additional new roles, both unions and other worker organizations will be critical to the modernized system. In Australia, which has a wage board-like system as well as collective bargaining, more than 60 percent of workers have their wages set by wage awards or collective agreements.25 Further, wage growth for the majority of workers in Australia has far surpassed that for workers in the United States over recent decades.26 Experience with wage boards in U.S. states shows how significant wage increases could be from a national wage board policy. As previously mentioned, wage-board-style bargaining is also likely to boost economic productivity. Increasing productivity, or making more with the same or fewer resources, creates the potential for improvements in American standards of living and is thus critical to the long-run success of any labor relations system. Unfortunately, over recent decades, productivity growth has been significantly slower than it was during the decades following World War II.30 Although there is significant room for wage increases without additional productivity increases—U.S. wages have grown far slower than productivity has increased—over the long-run, higher productivity is a necessary but insufficient condition for higher wages. Indeed, faster productivity growth makes it possible for faster wage growth. Thus, a modern labor relations system should strive to boost productivity. Wage boards would help increase productivity in several ways. First, higher wages help reduce turnover and encourage innovation.31 Second, similar pay for similar work enables a more efficient allocation of resources, which speeds up the movement of labor and capital from low- to high-productivity activities.32 Third, by elevating conflict about pay scales to outside the firm, wage boards can enable greater collaboration within the workplace.33 Fourth, wage boards promote worker training by minimizing the employees’ financial incentives to leave firms once they are trained.34 Fifth, by making the rationale for pay increases clearer and more transparent—such as by identifying measurable skills—wage boards may be particularly motivational for workers who seek to advance their careers. Finally, wage boards can and should be paired with policies to improve our public workforce training system, as discussed in more detail later in this report. In short, wage boards will give workers a stronger voice in the economy as well as our democracy and will raise wages and help rebuild the middle class. There are many ways to achieve a bargaining system where most bargaining is done above the level of the firm. However, the system that makes the most sense for the United States would build on the wage board model that currently exists in several states including California and New York. In the proposed system, representatives of workers, businesses, and the public would form a panel with the power to set minimum workplace standards for industries, regions, and occupations. Because union power has been eroded by decades of attacks, a tripartite system is necessary to bring all parties to the table. As worker organizations gain strength, however, the wage board system could evolve so that more bargaining takes place directly between representatives of workers and groups of firms. The basic goal for these panels would be to foster negotiations about how much of industry revenues should go to workers versus employers and then set standards to help achieve these levels. Standards that panels set would be floors. Individual workers and firm-level unions could negotiate for improvements but could not go below set minimums. Similarly, state and local governments could set higher standards. Wage boards’ ability to set base pay levels above the legislated minimum wage and higher wage scales for particular skills, as well as benefit and scheduling standards and profit sharing requirements, ensures that they can help improve working conditions for both middle- and low-income workers. A stripped-down version of this model recently occurred in New York state’s fast food industry, where representatives of workers, employers, and the public came together to evaluate the industry and set a $15 minimum wage.38 To help imagine what a more full-fledged version of this model could become, consider the National Football League (NFL) as well as TV show writers. The analogies are not perfect, but they do provide a general understanding of what may seem like a difficult concept. In the NFL, the players’ union and the 32 team owners bargain collectively to divide up the total share of league revenue and provide minimum salaries for rookies and veterans. For example, NFL players will receive at least 47 percent of league revenue under their current agreement, and in 2017, rookies were paid a minimum season salary of $465,000 while veterans earned higher minimums based on their seniority.39 Of course, teams can—and many do—pay players more than league minimums. Similarly, the Writers Guild of America East and West negotiate a nationwide Minimum Basic Agreement with the Alliance of Motion Picture and Television Producers that provides for minimum wages; portable pension and health benefits; a process to receive proper credit for one’s work; and residual payments to writers when produced content is exhibited outside of its initial window. Writers can—and frequently do—negotiate for higher standards, but employers cannot pay less than the agreed upon minimums. In 2017, for example, a writer of a story and teleplay for a 30-minute primetime network TV show received a minimum fee of $26,303, and roughly 40 to 50 percent of that amount for each prime-time network rerun that airs, depending on the show’s budget. Moreover, the company is required to pay an additional 19 percent contribution on top of the writer’s salary and TV residual payments to the Writers Guild of America’s pension and health fund to cover the writer’s benefits.40 Minimum payments for non-network primetime shows are less, but follow a similar format. Even when a writer changes employers, their work is still covered by the Minimum Basic Agreement, and they therefore continue to receive the minimum pay and benefits that the collective bargaining agreement guarantees. With a wage board, truck driving and delivery services could become a middle-class job. For long-haul trucking, the wage board could set minimum national standards for the industry analogous to the minimums in the contracts for television writers and NFL players. For drivers with the additional skills required to transport hazardous cargo, these minimums would be higher. For truck drivers on local routes, the board could set minimum standards that include regional variations. The standards would apply to all drivers, regardless of if they were independent contractors or employees. State wage boards could improve upon these standards. As the industry evolves toward driverless transportation, the wage board could still ensure that the workers in the industry—whose jobs include monitoring the truck and load’s status and making the final delivery—could still earn a decent wage allowed by the greater productivity generated in the industry. The bargaining panel process would provide strong legal protections for participating workers as well as some funding and other incentives for worker organizations to facilitate worker participation. This is designed to ensure that workers and their representatives can mount a persuasive case for raising wages and have sufficient power to encourage business and government representatives to seriously consider supporting increases. The goal is to enable workers to stand on relatively even footing with employers. This part of the process is critical because if workers do not have sufficient power and protections, the wage board process is unlikely to lead to tangible improvements in workers’ lives. Without structures to ensure strong worker participation, employers will be able to use their superior resources to dominate—just as they have in recent years in Congress and state legislatures as well as in their efforts to prevent workers from forming unions and at the bargaining table with existing unions. Indeed, without a structure that allows for substantive worker participation, the wage board process could lead to lower standards for workers and drain the limited resources of workers and their representatives. A wage board process that lacks strong worker participation would create an additional forum that would spread thin already under-resourced unions and thus make it easier for employers to reduce standards through their superior power to compete in every forum available—including the workplace, legislatures, and the wage board. While the full wage board model requires changes to federal law, states have the power to enact many elements of the model, as described in detail in the Center for American Progress Action Fund’s (CAPAF) report, “How State and Local Governments Can Strengthen Worker Power and Raise Wages.”43 Additional details on how wage boards can be structured can be found in the section below. There are a number of ways to achieve the basic goals outlined in this report of raising wages and fortifying worker voice, as a prior CAP report, “The Future of Worker Voice and Power,” and CAPAF report, “How State and Local Governments Can Strengthen Worker Power and Raise Wages,” have explained. This report emphasizes one of those ways, and the following section provides additional details on how the wage board system could be structured. In setting standards, panels would be tasked with establishing a fair wage for workers based on a range of economic and social factors, including the skill level of the work; current compensation in the industry; productivity; revenue; profits; pay ratios between executives and median- and low- wage workers; the cost of living; and what is necessary for workers’ health and well-being.46 Bargaining panels would be national and could make adjustments to allow for regional wage variations. Just like with the minimum wage, state governments—and local governments with the proper authority—would be able to set their own standards so long as they were higher than those set by federal bargaining panels. States could use a similar wage board process to do so, and could even form regional wage boards with neighboring states. Industrywide panels would be scheduled to convene every few years, but panels could be triggered more frequently if enough workers or businesses petitioned for one. In the case of inaction, standards would automatically increase to keep pace with inflation. This set default would incentivize workers to push for wage board action so that they can benefit from real wage increases and would ensure workers do not lose ground if the board does not act. Panels would be ruled by majority vote, except in the case that the panel seeks to reduce standards below prior levels, in which case a supermajority would be required. Panel decisions would be subject to approval by the secretary of labor. Panels could go above the legislated standards such as the minimum wage but could not go below them, even with a super-majority vote. The secretary of labor would determine the industry categories for each separate wage board. In determining industries, the secretary should aim for consistency with classification schemes in use by the agency, as well as strike a balance between coherence of the industry and limiting the overall number of industry committees.47 Industrywide panels would cover all workers in a given industry and could set different wages for different occupations within the industry. The secretary of labor would issue guidance for categorizing workers into industries and occupations. Employers would then classify their workers, a decision that would be contestable with the Department of Labor and through private right of action. Employers would be responsible for repaying all lost compensation if they wrongly categorize workers, and would be subject to fines and damages that escalate for repeated occurrences to dissuade the practice. Wage boards would have a modest staff and would be available to help employers with classification. For occupations that are widely dispersed across multiple industries, the secretary could, on a limited basis, create an entire wage board panel based on a single occupation.48 The secretary would have the authority to determine if additional data need to be collected to help determine industries or to facilitate the workings of any wage board. The right to speak freely, protest, engage in political activity, and strike for higher wages in an industry or from a group of employers—not just a single employer—would be guaranteed and enforcement of penalties for violations would be meaningful. Similar protections would be provided for participation in works councils. Wage board standards would be enforced by the Department of Labor as well as by states and private actors through the courts. Enforcement of wage board standards would follow the co-enforcement model that utilizes the capabilities of the Department of Labor, civic and worker organizations, and private rights of action.50 The wage board awards would provide unions and other worker organizations with funding to help educate workers about the standards. These groups could also collect a share of awards if they help workers recover stolen wages or benefits. States could also provide higher standards and more stringent enforcement, akin to Occupational Safety and Health Administration state plans. Firms that exhibit significant control over companies they contract with would be jointly responsible for adhering to workplace standards. In short, wage boards would bring together workers, firms, and the public to negotiate over minimum workplace standards across industries. Wage boards build on existing policies and structures and are designed to work together in a comprehensive package of labor policies. Most importantly, wage boards would create a new framework for negotiations that would raise wages and boost productivity. Wage boards are one piece of a larger vision for a modernized collective bargaining system.54 Wage board bargaining should be complemented by measures—including works councils, representation on corporate boards, and incentives for union membership—that give workers greater voice at their workplace. Indeed, by elevating most wage negotiations from the firm level to the region or industry level, wage boards create a need and opportunity for additional kinds of firm-level participation by workers, as well as incentives for union membership. Placing workers on corporate boards is an important step toward further democratizing the workplace, allowing workers to have a say not only in smaller day-to-day issues through works councils but also on major strategic questions. With this change, workers would have input on significant decisions that affect the direction of a firm and the lives of its employees, such as how much firms outsource production and strategies toward developing employees’ skills. Board-level representation can ensure that the needs and interests of workers are given a voice on par with shareholders, many of whom only have a short-term interest in the firm, while employees may have a longer-term commitment to the firm and the community. To provide more detail about how works councils, workers on corporate boards, and incentives for membership could be implemented, consider the following proposal: Employers above a minimum threshold size would be required to hold elections for works councils every two years at each of their worksites.61 Workers would choose their representatives on the works council, not whether to have a works council. Works council representatives could affiliate with a union if they so choose. Works councils would have guaranteed access to information on the company’s economic situation, employment forecasts, wage structure, and anticipated changes to workplace conditions. Companies would be required to consult and jointly decide with the works council on changes to the workforce and working conditions. Works councils would have no formal say in decisions about wages or benefits. Works councils would select workers for representation on corporate boards, so that the boards of public and privately held corporations above a minimum size would have worker representation. Board membership would be evenly divided between members chosen by shareholders and members chosen by workers. The chair of the board would break ties. The chair would be chosen by shareholders but approved by employee representatives. Works councils, along with unions, would help support board-level representatives with research and information. Incentives for union membership would be provided though a new workforce training policy.63 A new dedicated source of funding would be provided for training delivered in partnership by labor organizations and industry groups. Labor organizations could use this training platform and access to workers to recruit dues-paying members. Raising wages and strengthening and growing the middle class requires a range of policies, including those that promote higher levels of employment; boost educational attainment; enhance the government safety net; and reform trade policy. Each of these progressive policy goals plays an important role in helping the middle class. Unfortunately, though a necessary part of achieving these ultimate goals, strengthening collective bargaining does not always receive as much priority as those other policies. Collective bargaining complements these policies and often can help address their limitations. Similarly, increasing taxes on the wealthiest Americans to ensure that they pay their fair share and by providing necessary benefits for low- and middle-class Americans is something that U.S. policymakers must do. However, it is not a stand-alone solution. There is a dignity in earning a living wage that is hard to replace. Furthermore, the scale of expenditure required to ensure that incomes increase in proportion to productivity for all workers—including both low- and middle-income workers—would be quite large. Consider the cost of boosting 2013 household market incomes for the bottom 80 percent of Americans by income to the level they would be at had they kept pace with productivity growth over the past 25 years. In 2013 alone, this would have required spending more than twice as much as what was spent on Social Security that year. 66 Similar additional expenditures would be required in subsequent years. While raising the minimum wage helps millions of low-income workers, the policy delivers more for those at the bottom of the wage distribution than it does for those in the middle. Incentives to promote worker ownership and broad-based profit sharing tend to increase total compensation and productivity and should be expanded.68 But policies that would spread profit sharing to all workers would likely cause employers to substitute incentive pay for wages if workers do not have the power to bargain over their compensation package. Moreover, profit sharing and worker ownership operate best when supplemented by high wages and empowered workers. That is why profit sharing should be a subject for wage board negotiations rather than a stand-alone solution to the wage challenge. Policies to achieve higher levels of employment, such as investments in human and physical infrastructure and a jobs guarantee, can help raise wages across the board by ensuring that labor markets are tight and workers are in demand. However, tight labor markets provide the most benefits for workers who are willing and able to shop for a new employer. Not every worker wants to threaten to quit in order to receive a pay raise, and not every employer pre-emptively raises wages to avoid losing employees. Furthermore, policies that support employment will have a hard time raising wages if the underlying private-sector economy remains below full employment. Even if the government becomes the employer of last resort, the wage for government employment will become a floor which private employers need only match. Workers will benefit the most if they can leverage the power of both higher employment and collective bargaining. Policies to promote higher levels of employment help workers strengthen their voices in negotiations, while collective bargaining ensures that tighter labor markets lead more evenly and directly to real workplace improvements. In short, a number of policies are necessary to ensure stable, long-term wage increases for the vast majority of the population. Collective bargaining complements these policies and plays a critical role that is hard, if not impossible, to replicate. Collective bargaining directly gives workers power to negotiate for better working conditions. Other policy solutions increase worker power indirectly, meaning that their ability to raise wages depends on an additional course of action that may not always take place. In addition, workers engaged in the collective bargaining process gain agency and organization and thus can help provide the necessary political support for tighter labor markets, a higher minimum wage, reformed trade policy, a stronger safety net, and increased investments in skills and education. Modernizing the U.S. collective bargaining system would help raise wages and give workers greater voice and power, which would help address some of the fundamental challenges facing our economy and democracy. Moreover, the modernized system would help raise economic productivity, providing long-term economic benefits for workers and employers. The changes proposed are significant but proportional to the challenges the country faces and are based on proven policy successes. No other policies have the ability to so broadly and consistently raise wages. The solutions to the nation’s workforce challenges are at our disposal—the only question is whether the United States has the political will to move forward. David Madland is a senior fellow at the Center for American Progress. He has written extensively about the economy and American politics on a range of topics, including the middle class, economic inequality, retirement policy, labor unions, and workplace standards such as the minimum wage. His book, Hollowed Out: Why the Economy Doesn’t Work without a Strong Middle Class, was published by the University of California Press in July 2015. Madland has a doctorate in government from Georgetown University and received his bachelor’s degree from the University of California, Berkeley. The author would like to thank the numerous people who provided input that improved this report, including: Matt Dimick; Kate Andrias; Arun Ivatury; David Rolf; Damon Silvers; Stephen Lerner; Karla Walter; Alex Rowell; Carmel Martin; Ben Olinsky; and Marc Jarsulic. In addition, others acknowledged in prior reports provided input that helped shape this paper. I relied on their advice and insights, though the final report is not necessarily reflective of their opinions.